Xiaomi launched the Mi A1 under the Android One program with Android Nougat and promised Oreo by the end of 2017. The update arrived on the last day of the year, but Xiaomi got ahead of itself because users started complaining about unresponsive apps and battery drains. The company acknowledged the issues and stopped the update. The rollout of 8.0 will resume “in next couple of weeks”, Mi India confirmed on social media. Some of the issues that Mi A1 users reported to Xiaomi were unresponsiveness of the camera app, dialer app, Recents app and the ambient light sensor. The swipe on fingerprint sensor gesture was not working, and the battery drained massively when the Bluetooth was turned on. While half the problems are yet to be cleared, Xiaomi offered a workaround for the dialer app. 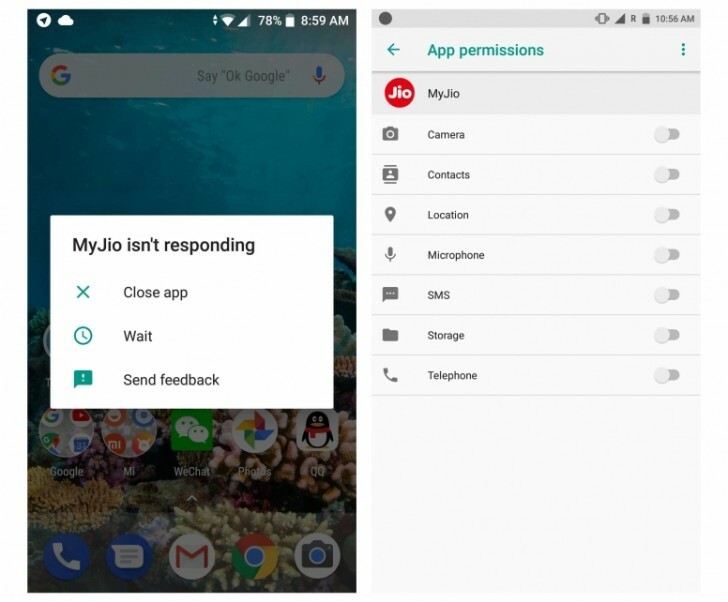 At the Mi Community forums, a Xiaomi representative suggested users uninstall MyJio app from the phone, or if they want to keep using it, to disable the “Telephone” permissions. After the updates it behaving badly ....i cant run you tube on it, it took ages for you tube to start. Any solution. Even facebook is not updating posts.